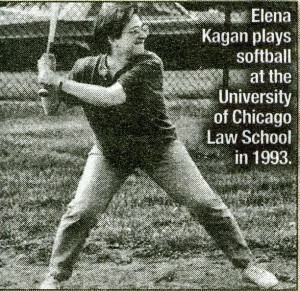 Though Supreme Court nominee Elena Kagan’s Chosen status is something of an issue (“Top court will have no Protestants with Kagan“) and newspaper profiles are filled with fun cultural anecdotes about the nation’s next Jewess Justice, all the blogosphere really wants to know is: For which team does the single softball-playing Solicitor General bat? 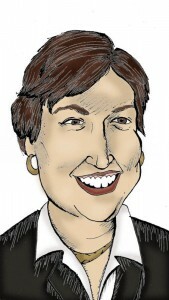 After a CBS blogger wrote Kagan was “out,” White House officials went on the offense, calling it plagiarism and a “stereotype,” since she’s clearly just a very successful single gal who just happens to be athletic and bear a striking resemblance to Cynthia Nixon’s girlfriend (lovingly known as “Rojo Caliente” at Dlisted.com). 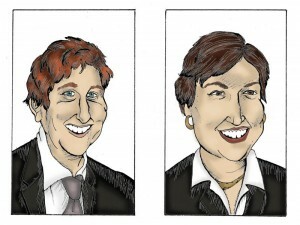 Yes, even with the denials, Kagan’s become the most famous lesbian member of the tribe since . . . Lily Tomlin? Susan Sontag? She’s the most famous Jewish lez ever! Though it’s not the first time someone has questioned a nominee’s sexual orientation (Souter and Sotomayor), it looks like a real-life closeted gay will finally sit on the bench in an era when everyone’s savvy enough to realize it. Kagan enjoys playing baseball, basketball and poker, which proves nothing, but, let's be honest, doesn't particularly help convince anyone she's heterosexual. This week, the internet has been tuning up its gaydar, and every blog and group has an opinion. Slate’s Jack Shafer wishes she would just come out already, thinking confirmation hearings will normalize the idea of a gay Justice. Far right groups like The American Family Association, Americans for Truth and The National Organization for Marriage are all demanding she reveal the truth before her gay agenda corrupts the court that gave us Citizens United v. Federal Election Commission, which allows corporations to buy and sell political candidates and call it free speech (which Kagan argued against). Meanwhile, activists on the left are also asking her to be here and queer, hoping people will, y’know, get used to it. Even yesterday’s huge New York Times article contains some coy, well-placed hints about the “poker-playing, glass-ceiling-shattering” dean of Harvard Law. One professor hired by Kagan is quoted as saying, “She was one of the most strategic people I’ve ever met, and that’s true across lots of aspects of her life.” [Emphasis ours] After the obligatory tale of how Kagan argued with her rabbi over her Bat Mitzvah, the reader finds out she “has never married” and “impressed the male clerks by joining their pickup basketball games.” Also, though Kagan’s thin paper trail reveals little, she did stop the military from recruiting at Harvard because of discrimination against gays (and, for some, that’s as good as riding a Harley with the Dykes on Bikes). In the end, as long as Kagan can score just one Republican vote, the highest court in the land will seat both a coffee klatch partner for Ginsburg and a lady loving arbiter of justice. Our advice? It seems unlikely any openly gay nominee can be confirmed in today’s political climate, much less one who’s already a Jew, so be smart, Kagan. Everyone says you’re a pragmatist. Act cagey until you’ve secured that spot right between Thomas and Scalia, then speak loudly about your beautiful lover — preferably a black woman — and watch them awkwardly scoot away. It’ll be worth the wait. Lily Tomlin isn’t a Jew.